Love is a roller coaster. And so is a career as a musician. There’s no better analogy to use to describe both. Just ask Mel Monaco, who has spent the last two years enduring the endless ups, downs, twists and turns in both her love life and her musical career. To say it’s been a wild thrill ride is an understatement – try Leviathan stacked on top of Behemoth with a jarring, bumpy blast of The Comet. Thankfully, the perpetual motion machine known as Mel Monaco has been channeling the experiences the last two years have thrown her way into her most prolific creative outpouring yet: a new double LP release entitled Falling For The Third Time. The 16 original tracks and four conversation pieces sprinkled strategically between songs read like a diary, chronicling the emotional growth of a young artist on an often tumultuous journey of self-discovery. There is lots of love, loss, heartache, hopefulness – and ultimately, redemption – to be found woven into the stories told in each song. Monaco admits the cathartic outpouring helped her to both heal from the wounds while maturing as a songwriter. Songs like “Hold Me Back,” “Me/You,” “Sonny to My Cher,” and “Unglued” provide an intimate look into the singer’s mindset during the writing and recording of this ambitious project. In terms of the music, the songs on Falling For The Third Time deliver a tasty variety of flavours and influences, from the soulful slow-burn of “When I Groove” to the upbeat, 50s-inspired bounce of “Your Sorries Fall Short on Me.” Despite the extensive track listing, however, Monaco says there was ample material left over. 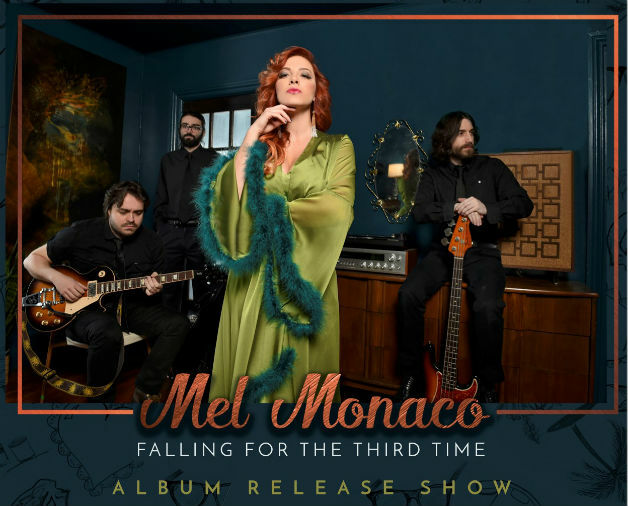 The album release party at Robertson Hall will be the first opportunity for Monaco fans to hear all the new songs, although with its limited capacity demand will no doubt exceed availability. Monaco says she chose the intimate venue for a very specific reason. Besides being sold on-line at MelMonaco.com and iTunes, the new release will be available at both MindBomb (James Street) and That’s Entertainment. The album release party marks the beginning of a busy six month promo schedule for Monaco, who besides releasing her fifth annual promo calendar will also be hitting the road for tour dates in Muskoka, Toronto, Peterborough and Hamilton. For tickets and details, visit www.MelMonaco.com.